Dior Addict Extreme Lipstick and Colour Block Nails - with swatches! 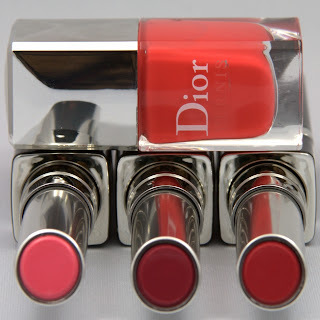 Dior Addict Extreme Lipstick combines vibrant colour intensity with the perfection of luminous shine in breathtaking shades that make lips glow with radiant shine in vibrant colours with dazzling pure pigments. The formula combines 4 waxes with targeted action for an extraordinary finish where comfort and shine melt in an incredibly thin layer with ideal hold, as well as plumping hyaluronic acid spheres and delicate shine-boosting oils. Dior Addict Extreme Lipstick - $31 - now officially it comes in 12 colours: 536 Lucky, 756 Fireworks, 866 Paparazzi, 789 Bellissima, 829 Sunset Blvd, 987 Black Tie, 316 Incognito, 356 Cherie Bow, 339 Silhouette, 667 Avenue, 639 Riviera, 476 Plaza, - but the press release I received has 6 extra colours: 336 Saint Tropez, 366 Pink Icon, 479 Holiday, 486 Cruise, 536 Lucky, 857 Princess - I'm not sure if they are limited edition shades, Canadian only or what so there you go... you'll find swatches of a couple of these ones below. 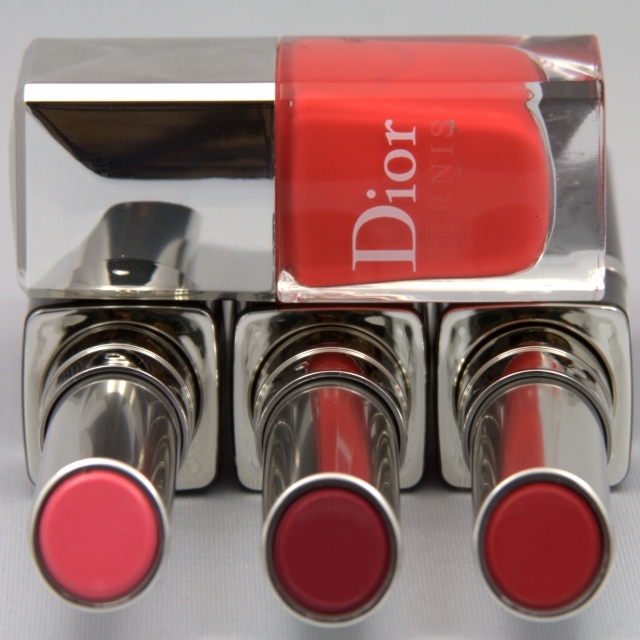 As well as a Dior Colour Block Nails collection - $24 - 537 Riviera - electric coral, 659 Lucky - bold and dazzling pink, 579 Plaza - mauve pink, 257 Incognito - discreet greige - each of the polishes matches one of the lipsticks of the same name - perfect for the matchy-match trend going on right now! The polish is pure love and the feel of the lipsticks is light and comfortable and you'll see in the swatches the amazing shine that they have! On counters now so go swatch to your heart's content! Cover FX launches on The Shopping Channel! Quo Mother's Day Collection and Contest! Murale wants you to shop naked! This week I'm (still) obsessed with... RapidLash! Smile - we're having an Oral-B Contest! Here comes the sun - safely with La Roche-Posay! Essie 2012 Wedding Collection - swatches! This week I'm obsessed with... Essence of Argan! I'm in cupcake heaven with Upper Canada Soap! Nifty notions - Clearasil PerfectaWash! Estée Lauder and MAC want to make you blush! 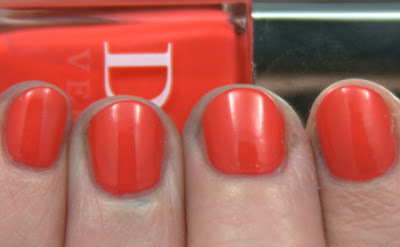 Essie Spring Collection 2012 swatches!